Losing your hair during chemotherapy is not easy, but it can be easier to cope with if you have a better idea of what to expect. Here's what cancer medical professionals and survivors told The Patient Story worked for them. When should I cut my hair or shave my head? Does hair look the same when it grows back? What is scalp cooling or “cold caps”? Can cold caps or cooling caps prevent or lessen hair loss? How much are the cold caps/cooling caps? What can I wear on my head when I am bald? What kind of wigs are there? How much is a wig? Why does chemotherapy cause my hair to fall out? Does every chemotherapy cause hair loss? Is it only hair on the head that falls out? When will my hair start to fall out after chemotherapy starts? Can other cancer treatments cause hair loss? Does it hurt when hair starts to fall out? Is the hair loss permanent? When does hair start to grow back after chemo? Chemotherapy damages fast-growing cells. One can predict what the side effects might be. The fast-growing cells in the body may be the cancer cells and that’s why we use chemotherapy to damage those fast-growing cells. The other fast growing cells are in the hair so many chemotherapies cause temporary hair loss because we damage those cells. Chemotherapy drugs target rapidly growing cancer cells. Hair follicles have rapidly growing cells. So hair loss, also called "alopecia," tends to be one of the most significant and noticeable side effects after chemo. Be sure to ask your doctor and/or nurse about your chemotherapy regimen and whether it's known to cause hair loss. This varies person to person. Generally speaking, hair loss caused by chemotherapy happens around two to four weeks after the start of treatment or around the start of your second chemotherapy cycle (again, depending on the factors listed above). There may also be more of a "hair thinning" than total hair loss, again, depending on the factors listed above. Radiation therapy that targets the head may lead to hair loss. It's possible depending on the dose of radiation that the hair may grow back differently. Your hair follicles may become "inflamed" from the chemo so depending on how sensitive the scalp is, there may be some pain. Our The Patient Story contributors have a mixed response, but more than not have described feeling some sensation on their scalp when the hair begins to fall out. Your scalp hurts. At least for me it did. It was so painful. So I had very very white-gray hair naturally, now it’s a bit darker grown back in, but you could see the red of my scalp and I just wanted it off. It was painful. No one tells you that. In the medical system no one tells you that because it’s not “important." What’s important is curing you of cancer but what’s important to us as cancer patients, as the person who is dealing with it is to know how to navigate all those pieces of the puzzle. And to be able to anticipate some of it. This may not happen to you but I wanted to give you a head’s up. For the most part, thankfully, chemotherapy does not cause permanent hair loss. In rare cases, some higher-dose radiation therapy targeting the head may result in no hair regrowth. This varies. 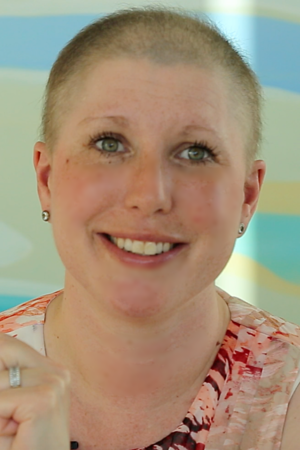 The Patient Story contributors mostly report hair regrowth beginning as early as a couple weeks after treatment. How does the hair loss impact you personally? There was a range of response in terms of how our The Patient Story community members were impacted by the hair loss. Most said they were emotionally drained by the prospect of losing their hair and that anxiety or fear of being bald was because it made them "look sick." However, they also said they were relieved to shave it all off. For some, it felt like taking back some control in their lives. The hair loss on my face was more difficult because I have always had very thick eyelashes and eyebrows so I didn’t enjoy that by any means, but they start to grow back between each cycle so I know they’ll come back quickly. It’s definitely nice not having to shave my legs though! This is a very personal decision. Most The Patient Story contributors with longer hair said they wanted to cut their hair to avoid feeling a dramatic loss. Many shared their fear of seeing large clumps of their hair on their pillows and on the floor; cutting their hair shorter helped them feel lighter and less anxious. It may. Hair can carry a different color or feel different when it first regrows, oftentimes curly (also known as "chemo curls") regardless of whether you had straight or curly hair before cancer treatment. Cold caps or cooling caps are "devices" that essentially delivers scalp cooling or hypothermia to the scalp to constrict or tighten up blood vessels in the scalp. This is meant to cut down the amount of chemo that reaches the cells in the hair follicles. They generally look like "helmets" filled with gel coolant and strapped onto the patient's head for a tighter fit. Question Is scalp cooling associated with a lower risk of hair loss when used by women receiving common adjuvant chemotherapy regimens for early-stage breast cancer? Margaret wearing her cold cap during breast cancer chemotherapy treatment. Findings In this multicenter study, hair loss of 50% or less (Dean score of 0-2) was seen in 66.3% of patients in the scalp cooling group vs 0% of patients in the control group at 4 weeks after completing non–anthracycline-based adjuvant chemotherapy. Three of 5 quality-of-life measurements, including feeling less physically attractive, showed benefit for women who received scalp cooling. Meaning This self-contained cooling system was associated with a lower risk of hair loss among women receiving non–anthracycline-based chemotherapy for early-stage breast cancer. The Patient Story contributor and breast cancer survivor, Margaret Abe Koga, tried the cold caps. In her post about hair loss, she talks about how the cold caps helped save about 60-percent of her hair. However, she also described it as "the hardest part" of her chemo treatment. By the end, by the last cap, I was just wiped out and it’s like a brain freeze that entire time and a headache. So that was probably the most painful part. With that said, Margaret still encourages everyone who's interested in saving at least some of their hair to look into the cold caps or cooling caps as an option, acknowledging also that the technology is advancing to make it more comfortable for patients to wear. This depends on which company you rent from. Margaret tried cold caps and reported them to be roughly $1500 during her three-month chemotherapy treatment (she says they saved 60-percent of her hair). ● Baseball cap with hair attached to sides: this is non-Hodgkin lymphoma survivor Stephanie Chuang's favorite because it's comfortable and can look like your real hair. Your scalp won't be bothered by the cap material which is usually cotton. ● Rocking the bald look! Keyla reminds us that you can look absolutely beautiful going out without anything on your head. May sound cliche but all you need is truly your confidence. Synthetic wigs tend to be the most popular because they are usually much cheaper (and less required care) than the other two choices. The synthetic styles range from about $25 to a few hundred dollars compared to around $1,000-$3,000 for a human hair wig. Wigs made of both material hit somewhere in between. It may cover part or all of the cost of the wig, especially if your doctor about writes a prescription for an "extra-cranial prothesis" to submit on an insurance claim. American Cancer Society has different programs available depending on where you are. You may also call 1-800-ACS-2345. Friends are By Your Side offers free wigs for people diagnosed with cancer around the world. It also gives styling services and advice. Lolly's Locks "works with wig-providers across the country to serve a diverse population of cancer patients because we know cancer has no boundaries. In just four years, we have provided wigs to over 475 women in 47 states." Hair Loss (alopecia). National Cancer Institute. https://www.cancer.gov/about-cancer/treatment/side-effects/hair-loss. Accessed Aug. 9, 2018. Association Between Use of a Scalp Cooling Device and Alopecia After Chemotherapy for Breast Cancer. Journal of the American Medical Association (JAMA). Accessed Aug. 6, 2018. What to Do About Hair Loss (alopecia). National Cancer Institute. https://www.cancer.gov/publications/patient-education/radiation-side-effects. Accessed Aug. 10, 2018. Chemotherapy and Hair Loss. MD Anderson Cancer Center. https://www.mdanderson.org/patients-family/diagnosis-treatment/emotional-physical-effects/hair-loss.html. Accessed Aug. 10, 2018. Preventing Hair Loss During Chemotherapy is Now Possible, but Insurance Coverage is Inconsistent. https://www.forbes.com/sites/victoriaforster/2018/08/08/preventing-hair-loss-during-chemotherapy-is-now-possible-but-insurance-coverage-is-inconsistent/#47f8e8f77473. Accessed Aug. 10, 2018. I did not understand my relationship with my hair until I was diagnosed. I think the times I broke down and cried over my diagnosis were triggered because I knew my hair was going. When did you decide to cut your hair? I needed to kind of get control back a little bit. All of a sudden you lose your hair after the second chemo. It’s almost like clockwork. So it was after the second chemo. I didn’t realize how important my hair was until the idea of losing it all was in front of me. I really didn’t think it was going to be a big deal but it was. You used "Cold Caps" to save your hair. What are they? Your hair starting growing back a few weeks after chemo ended. How was that? It was so amazing when my hair started growing back. I never had super, super short hair. Never buzzed my hair or anything but I thought I looked pretty cute when I had really short hair. I all of a sudden felt this new confidence, maybe like, "Oh, I actually look okay!" It was not a look I had ever intended but it was fun. There was some joy in it. When it started falling out I had to go to a wedding so we cut it up to my shoulder and still at the wedding, there was just hair everywhere. So when I got back from the wedding I said to my husband okay I’m ready. Let’s shave this, let’s just do this, it’s awful having all this hair all over me. What helped you feel better emotionally about the hair loss? I think I finally accepted we’re moving forward. So looking at that, the hair came off. We’re moving forward. Now it’s onto the second round of chemo. Hair loss on my head wasn’t a big deal for me when it happened. It was actually a relief when I shaved it off because my head started to be very tender and burn a little as my hair was falling out. I purchased a wig and also had someone give me one, but I mostly just rock a light beanie or go bald and proud. I’ve learned that I care much more about how I look than anyone else and I can’t even see myself on a regular basis so why dwell on something I can’t control?